White flowers, III–V, sparse, slightly scented; yellow foliage all year being brightest in winter and spring; height 1m and more; spread 75–100cm. A sport from Erica arborea 'Alpina' propagated by Albert Turner (Birmingham, UK); introduced by Denbeigh Heather Nurseries (Creeting St Mary, Ipswich, Suffolk) by 1975. Named after Albert S. Turner(June 1916-January 2018). White flowers, IV–V, profuse; lime-green foliage with bright yellow young shoots in spring; broad compact habit; height 1m and more; spread 61–75cm. Hardier than some other clones. Collected in Serra da Estrela near Coimbra, Portugal, in 1972 by R. Zwijnenburg and introduced first in the Netherlands. The name is derived from the place where the plant was found, but spelled incorrectly. Flowers white; III-V; foliage yellow-gold; habit upright. Very nice bright yellow and tightly upright and distinct from 'Estrella Gold'; more floriferous than 'Albert's Gold' and easier to propagate. Sport on Erica arborea ‘Alpina’, found by Chrystal Joy Gillingham in 2004 at Wilson's Nursery Ltd, Chilliwack. ® E.2008:10 registered on 29 November 2008 by Wilson's Nursery Ltd, Chilliwack, British Columbia, Canada. 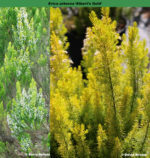 White flowers; III–V; foliage rather sparse; gold to lime-green foliage; habit more open than 'Albert's Gold' but as hardy; height 200cm; spread 150cm. Collected at Alto Campoo, Cantabria, Spain, in 1982 by David McClintock, Charles Nelson and David Small. Name alluding to country of origin and the foliage colour. Registered on 18 February 2000 by D. C. McClintock. 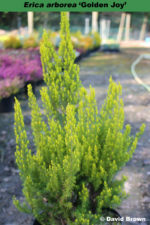 White flowers, IV–V, buds pink; soft light green foliage, shoots tipped pinkish yellow in early winter; height at least 1m; spread 75–100cm. Tender; can only be grown outside in the mildest climates. Wild-collected; found in Spain by Rinus Zwijnenberg about 1972; introduced in 1979 by P.G. Zwijnenburg (Boskoop, Netherlands). Names alludes to the flowering season.